Ernesto Fonseca won the second round of the 250cc World Supercross series in Arnhem, Holland on Saturday, December 13. 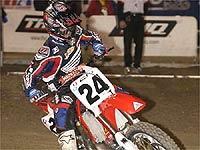 The works Honda rider led for the duration of the 20-lap main event, followed home by fellow Honda rider Damon Huffman. Suzuki’s Andrew Short finished third. Daryl Hurley, who won the opening round in Spain a week earlier, had to settle for 13th place in a field missing US Supercross stars Ricky Carmichael and reigning champion Chad Reed. The 125cc final was a European affair, with Belgian Honda riders Steve Seronval and Ken de Dijcker. Third went to Dutchman Rob van Vijfeijken on a Yamaha. 1) Ernesto Fonseca. 2) Damon Huffman. 3) Andrew Short. 4) Grant Langston. 5) Keith Johnstone. 6) Jay Marmont. 7) Tyler Evans. 8) Heath Voss. 9) Greg Schnell. 10) Doug Dehan. 11) Mike Brown. 12) Steve Boniface. 13) Daryl Hurley. 14) Craig Anderson. 15) Isaiah Johnson. 16) Jason Thomas. 17) jeff Gibeson. 18) Joe Oehlhof. 19) Ryan Clark. 20) Cheyne Boyd. 1) Steve Seronval. 2) Ken de Dijcker. 3) Rob van Vijfelken. 4) Jurgen Van Nooten. 5) Lukas Weis. 6) Marcus Stallamnn. 7) Vincent Collet. 8) Cedrick Jurion. 9) Adriaan van Dijck. 10) Edyward Hermsen. Discuss this story on the Off Road message board by following the link on the right.